Engineered timber products such as cross-laminated timber must be exempt from the UK government's ban on combustible cladding materials, as they are essential in the global battle against climate change, say architects. Waugh Thistleton co-founders Andrew Waugh and Anthony Thistleton and dRMM founding director Alex de Rijke have all urged the government to review its legislation, which prohibits the use of timber products on the external walls of residential buildings taller than 18 metres. Waugh and Thistleton said the new policy "demonstrates a misunderstanding of the fire performance of engineered timber". "We are clear that mass timber construction is not a valid target for this change and will continue to advocate for its exemption," said the pair. De Rijke, who has completed many buildings using cross-laminated timber (CLT), said the material is safer than steel in a fire. "The government is mistaken to consider engineered structural timber materials, like CLT, as highly combustible thin cladding material," said De Rijke. "Mass timber is slow-burning, self-charring – even self-extinguishing, structurally predictable, and does not produce deadly toxic fumes in a fire," he continued. 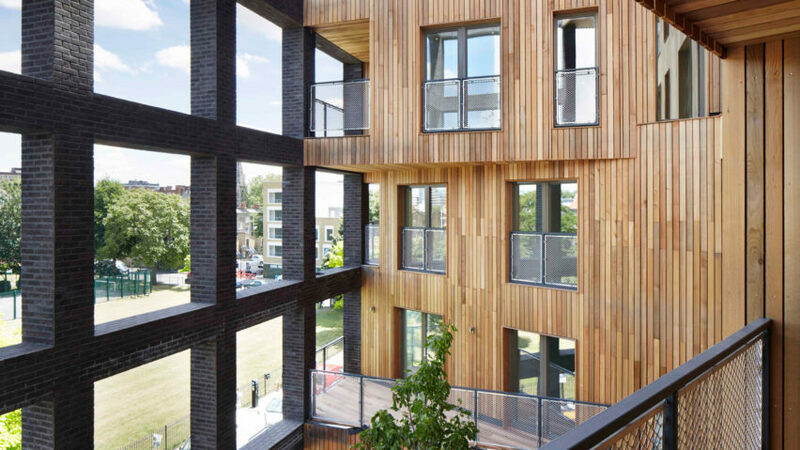 De Rijke gives Kingsdale School, the UK's first CLT building as an example. "dRMM were the UK's first architects for a CLT public building in 2004 – the government-funded Kingsdale School – and accordingly had to present the European material to central government, local authority and fire brigade. All were convinced then and now by the evidence that, when properly sized and detailed, CLT is not only safe in a fire, but safer than many other standard industry materials such as steel – ironically the default material for buildings over 18 metres. "Political knee-jerk reaction is uninformed"
The new legislation, titled Final Impact Assessment: Ban on combustible materials in external wall systems, states that only materials with a European fire rating of Class A1 or A2 may be used on the external walls of tall residential buildings, and states explicitly that wood products do not come under this classification. This is "likely to slow down the use of engineered timber in future development in the medium to long term" it claims. The policy was introduced in the wake of the Grenfell Tower tragedy, after it was confirmed that combustible cladding contributed to the fast spread of the fire. Architects have largely welcomed the ruling, but insist that CLT should be exempt. "This political knee-jerk reaction is uninformed and counter-productive. Banning safe timber construction prevents the creation of healthy and safe cities, and worsens the global environmental crisis of carbon emissions due to use of materials like concrete and steel," said De Rijke. "The Grenfell Tower fire was a tragedy and we fully support a ban on designing or building using combustible, volatile and toxic materials. But engineered mass timber is not one of them." Engineered timber, also known as mass timber, is increasingly being championed in architecture as a sustainable alternative to steel and concrete structural frameworks. Waugh and Thistleton claim that, even if the ban is maintained, the material is still crucial to the future of sustainable and fire-safe construction, as it is mainly a structural material not a surface material. The pair have worked on numerous CLT projects, including the "world's largest cross-laminated timber building". "The new legislation does not propose a ban on engineered timber or CLT structures; it will simply change the way we build tall timber residential buildings," they said. "The UK is a world leader in the development of engineered timber construction with over 500 buildings completed. As the government acknowledges, this change in regulations will have an impact on the continued innovation and development of low carbon construction, and hence on the rate at which the construction industry can tackle climate change," they said. "It is imperative that architects recognise the impact of their work on the environment. Waugh Thistleton Architects will continue to research, design and build using low carbon technologies and reducing our reliance on concrete and steel." Main image shows The Cube by Hawkins\Brown. Photograph is by Jack Hobhouse.